Do You Have to Refrigerate Eggs? I sometimes wonder what people think when they walk into my kitchen and see a big bowl of farm fresh eggs sitting on my counter. We are so conditioned to the notion that you MUST refrigerate eggs, I’m imagine some guests likely think we’re trying to kill ourselves with food poisoning. But, believe it or not, there is a method to my madness. Wait. Stop the presses! What did you say? Eggs won’t go bad if left out on the counter? Hard to believe, huh? Especially since we Americans are so accustomed to only keep eggs in the refrigerator. You likely wouldn’t have caught great-great-Grandma worrying about leaving her eggs on the counter, so where did this deeply held belief that we must refrigerate eggs come from? It all comes down to washing. Like I talked about in my egg washing post (man, we sure talk about eggs a lot ’round here…), fresh eggs come with this magical film from the hen called the cuticle or “bloom”. The cuticle seals the egg and helps to prevent bacteria from entering the very porous shell. 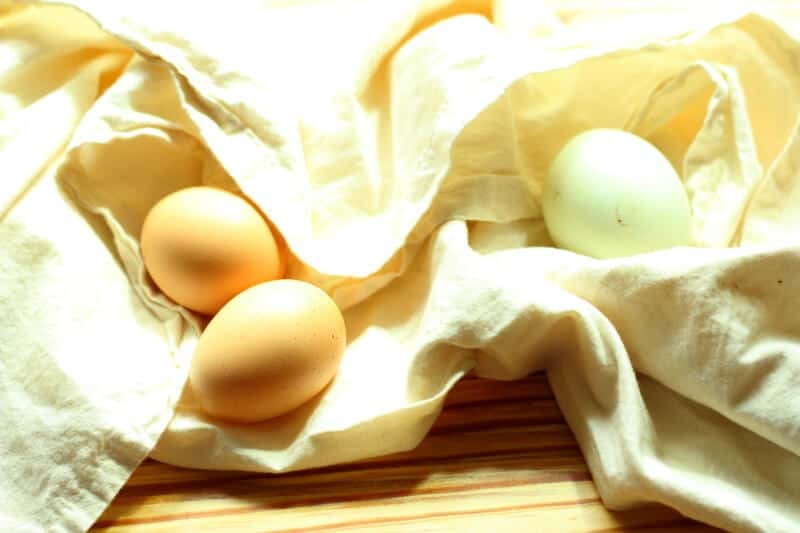 It also helps to prevent moisture loss, which happens as eggs age. However, since the USDA requires commercially produced eggs to be washed and sanitized before being sold, the eggs you buy at the store no longer have the majority of their cuticle intact. 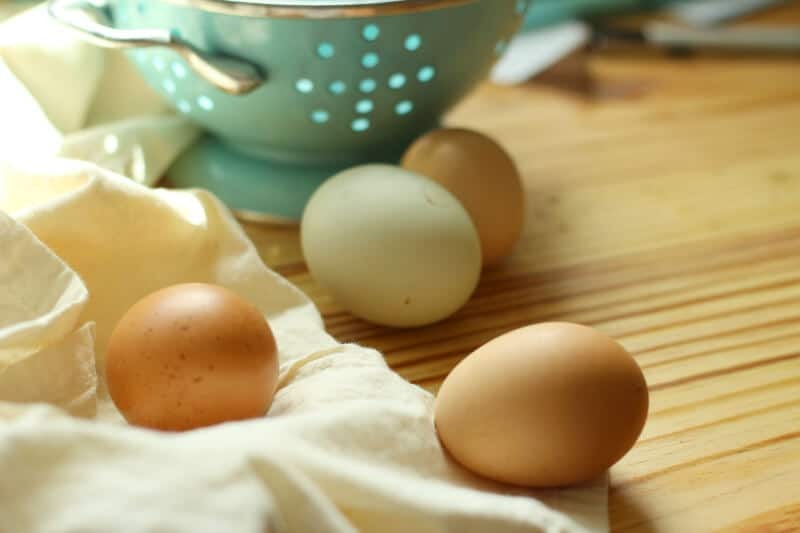 Without this natural protective coating, eggs tend to more susceptible to contamination, which is why refrigeration is recommended to slow the growth of bacteria. Fun fact: Washed and sanitized American eggs would technically be illegal in Europe, as European regulations specify eggs must NOT be washed before sale in an effort to prevent contamination. Europeans also tend to store their eggs at room temperature. Hmmmm…. Well, like most things, it depends on who you talk to…. But as far as I go? I don’t stress about leaving my beautiful fresh duck and chickens eggs out on the counter. Because I don’t immediately wash most of my eggs I am comfortable leaving them at room temperature for a while. This cuticle protects the egg. I have never had a problem with an egg going bad. Period. And it’s nice to have room-temperature eggs ready at a moment’s notice when I wanna bake a cake. Or whatever. If I get a super dirty egg, I will wash it in hot water and then refrigerate it. On the rare occasion I have store-bought eggs, I always refrigerate them. I only keep my eggs on the counter for about a week, if I need to keep them longer than that, I transition into the fridge. Keep in mind that room temperature eggs will age faster, so for long-term storage, it’s best to move them into the fridge. Once eggs have been refrigerated, they need to stay refrigerated. If a refrigerated egg is left out at room tempature for a long period of time, it will start to “sweat”. So we answered the question of whether or not you really need to refrigerate eggs, so how about some super snazzy countertop storage ideas? I don’t know about you, but there’s just something about a bowl of farm-fresh eggs in their various shades of brown, blue, and green that captures my imagination. I lot of people swear by this contraption called an Egg Skelter (affiliate link). I don’t have one personally, but it looks like a good way to keep track of which eggs are newer and which ones have already been out for a while. Or you could use a farmhousey enamel bowl. Or a colander in a bright color with a bit of vintage pop. So there you have it. 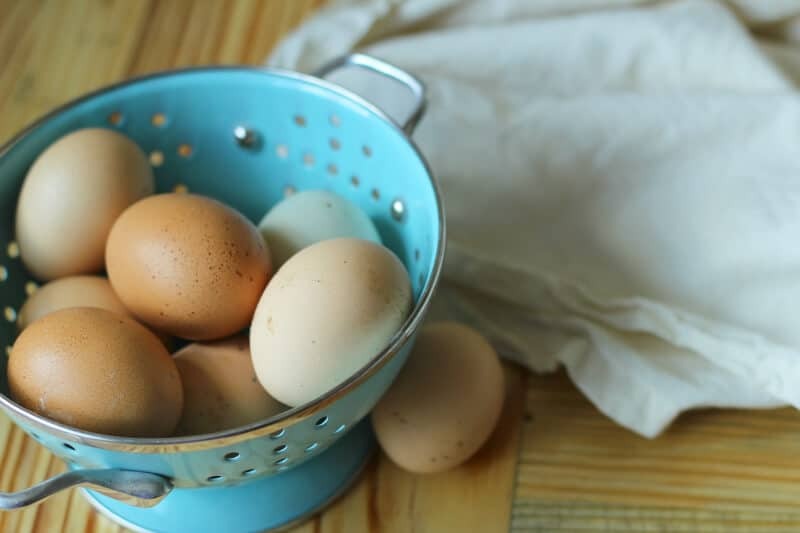 If you want to keep your eggs for months at a time, the fridge is your best bet, but otherwise, enjoy gazing at those farm-fresh eggs out on your kitchen counter, just like great-great-grandma would have. Thank you for your insights on home diffusers! As you look for a diffuser, do you purchase ones that are BPA free or use safe plastics, etc.? I am trying to find some that are considered safe. Great article! I too don’t refrigerate my eggs. I do wash them though and then rub them down with a thin sheen of mineral oil. That seals them so they can be stored longer. After oiling I date them and place them in my pantry. When the chickens slowed down their production over the winter we were still eating eggs that they laid the previous summer. Never had a bad egg yet, and no one got sick. Yep, I watched a youtube video about using mineral oil. I think it must be a good tip! But, otherwise, for every day use, just leave the bloom on, whether in frig or out. Yeah, I do this also, only if I have to wash them. I tested it the first time out, the eggs were over a month old and still good. I used to work for a large grocery chain years ago and that’s when I found out that most eggs are up to 9 months old. Figured if they could do it, I could too. Only eggs that get refrigerated here now are the 2 dz I keep in the kitchen fridge. I don’t refrigerate my store bought eggs (I’m in the US). Nor my store bought salted butter. While I don’t leave my eggs out forever (they are used up w/in a week), I’ve left butter out for months. Still alive to talk about it! When it’s hot and I haven’t killed my roosters yet, I refrigerate. Totally cracked a bloody egg into a cake once. Not repeating that. YES. Good point. I should have included that note. If I have eggs I know to have been fertilized in the summer, I refrigerate as well. Not a fun surprise! Jill, nice post. It just reinforces what I have been doing for 25 years! Some of my neighbors who drop by to buy eggs freak out that we keep a basket out for a few days before washing…THEN they go in fridge. We explain to them about the “bloom” and make them think back to the 1800’s when Little House on the Prairie didn’t have an ice box! It’s kinda fun to educate people who only thought eggs came from a store 🙂 I love your blog, informative and entertaining. We have been hobby farm enthusiasts for a 25 years, and still learn stuff! Yes! It is fun to educate folks. 🙂 And thank you for being a reader! What does the bloom mean? One of my best friends lived in Sudan for many years. That is where she learned to keep her eggs on the counter (and taught me!). YUP, in other countries it is illegal for egg producers to wash the eggs. I was always taught that if you wash your eggs after collecting them, you then have to refrigerate them and they will last for 2 weeks. 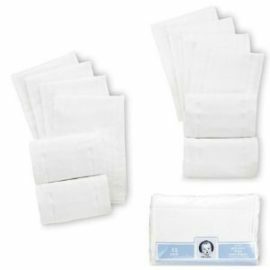 But if you don’t wash them they will last on the counter for 3 weeks. What are your thoughts on how long they should stay out or in the refrigerator? I know I’ve definitely left mine out longer than 1 week and they have been fine. 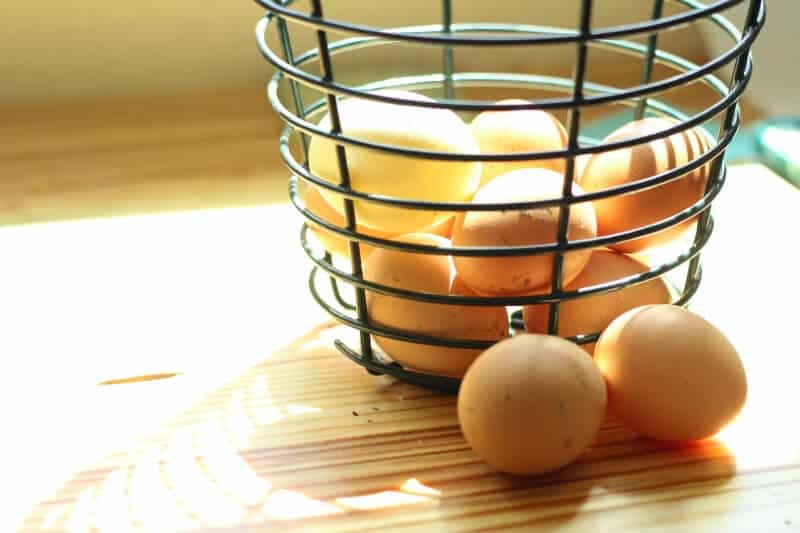 However, like the post mentioned, there have been studies that have shown the amount of salmonella in an egg (IF they have it) increases the longer it sits out. Just food for thought. Great article! Really appreciate knowing what I have been doing in my first year of hen-raising and egg-collecting isn’t off the mark!! I think I read somewhere that european chickens are inoculated against salmonella and north american ones are not. Any truth to this? I buy my eggs from the store,but I’m old enough to remember having farm fresh eggs delivered. I wipe mine off with a damp towel then put a thin coat of mineral oil on them. They keep for months in the fridge. I made deviled eggs from my long term storage eggs and my daughter freaked out to learn how old they were! Priceless. I remember reading an article about rubbing oil on eggs, but couldn’t remember which oil the author was using. She claimed that the eggs would last up to a year. Anyone else read that? So the eggs go into dormancy waiting for mama to up her temp and start setting. If they would go bad, there would be no babies.? 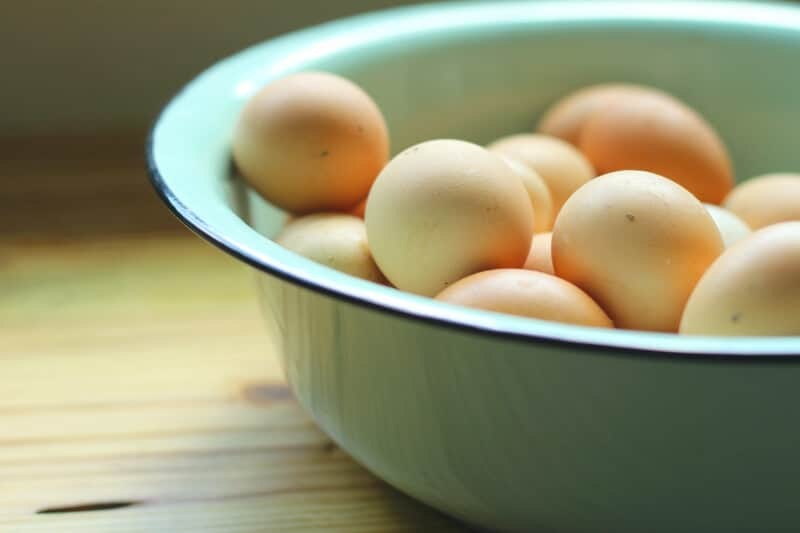 My grand mother used to tell me they stored eggs in lime water for use over the winter or in the spring house in the hot summer.Did you ever hear of this ? 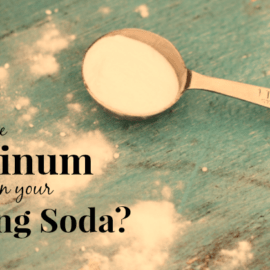 By the way what is lime water? And your right as long as you don’t wash the eggs they’re fine on the counter but I think the lime water was for keeping the eggs for months. I’ve never heard of using lime water– but sounds interesting. I have heard of people coating in mineral oil, or “glassing” them as methods of long-term preservation, though. I think that the temperature in the kitchen must be taken into consideration. I tried an experiment with our (fertilised) eggs. I put 4 dozen unwashed eggs in the pantry and kept them from August until January. The temperature was cool to cold, as the kitchen is north facing. On cracking the eggs, two of the forty eight eggs were bad. The remainder I scrambled in the microwave and gave to the hens to eat, mixing the crushed shell in. I could have easily used them, but had plenty of fresh eggs on the counter. 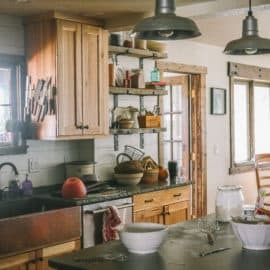 Agree– a warm summer kitchen will definitely cause faster aging in the eggs for sure. I was getting my eggs from an Amish woman about 20 minutes from my house. I had asked her to NOT wash the eggs she was selling to me so I could store them on the counter. She was a bit skeptical and I had to explain it to her. It was colder out (fall) and I was baking and freezing goodies for Christmas. I live in the city on a small lot that would not hold chickens (and not happily!). As kids, my sister and I would get hard-boiled eggs for Easter from our grandparents in an Easter basket that the ‘Easter Bunny” had left outside for us to find. Of course, my grandpa would hide the basket when he knew we were coming. 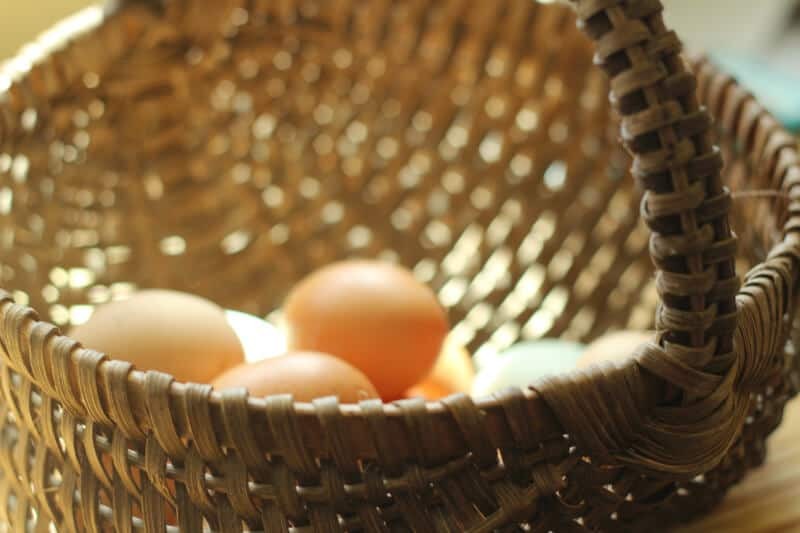 My sister and I used to keep those hard-boiled eggs in the basket in our house for up to 5 days and still eat them! We didn’t refrigerate them as we did not like them ice cold. We were 9/10 years old and continued to do this up until we were 12. I am sure we did this when much younger, too. We never, ever got sick. People find this gross when I share, but we did this every year. When I was a kid in the 50’s we had colored boiled eggs to hide for Easter. We would play with them and as long as the shells were not cracked we could eat them up to a week. Never got sick and eggs were delicious. I collect eggs in cartons on the counter without washing them. As I use them, I grab the oldest bottom carton and only then put them in the fridge. Then I wash the dirtier ones in COLD water just before I use them or just wipe them off. I’ve heard hot water shrinks the inside membrane and will cause the shell to draw in air or water and it’s not good for the egg. True or not, I don’t know. As my six year old son washed (very dirty) eggs for our breakfast he commented, “It takes a LONG time to wash all the chicken poo off these eggs! Dad told me they cover the eggs with something, to protect them, and I KNOW WHAT THAT IS! Poop.” ? HA! Good critical thinking there! I lived in Germany for years. I can remember my shock the first time I walked into a German grocery store only to find all the eggs sitting ON A SHELF, NEXT TO the refrigerated milk!!! Eventually, I became accustomed it, and while, I still refrigerate my store bought eggs, I do leave unwashed, farm fresh eggs on the counter. I live in the desert now, so I don’t leave them out very long. Europeans definitely still do things the “old” way. They still have cold storage basements. They dehydrate, and they use waterglass to store certain foods through the winter. (They also hang-dry their laundry on a regular basis. Dryers are very much a luxury!!) European refrigerators and freezers are a fraction of the size of ours, so there’s definitely something to be learned from other countries!! In the USA they wash the eggs, which removes the protective coatings. This is what requires the refrigeration. Most other countries do not wash the eggs, thus leaving the protective layer on, and it is perfectly fine to not refrigerate these. The muneral oil is just a way of adding back the protective coating. Someone may have already mentioned this: In the natural setting, eggs have to remain viable for up to 45 days, a Guinea egg is good for up to 6 months. In the wild, a hen will find a nest out under some brush or logs, and she will lay 10-15 eggs, 1 per day. When it comes time to set, she will incubate for 21-30+ days, and then she will hatch. She will usually go through that process in the spring when the temperature is moderate, not in the heat of summer. Eggs don’t hold up well in summer heat or winter cold. We buy eggs from a farmer that are the most wonderful things I ever tasted! The yokes are orange. I’m going to ask him if he washes them but I doubt it. I know they’re from free range chickens and they are out of this world!!! Any other eggs just don’t seem like eggs to me since we’ve been buying them from him. We buy Irish butter and always leave it out. It’s a gorgeous butter!! I’m in the UK (Cornwall) and most people I know, whether they have eggs from the shop or straight out of the chicken, have an egg holder on the counter, most commonly a chicken-on-a-nest shaped one. And our eggs are not refrigerated in the shops either. I was really surprised when I found that Americans keep eggs and butter in the fridge- and the dryer thing too, everyone I know has a washing line, dryers are for emergencies! So interesting, seeing how other people do things, thanks! My wife works in the medicinal grade egg industry for making vaccines. Eggs should be at a lower temp, but refrigeration at 45 is not needed. Most store eggs are 30 days old and can be boiled and shell removed easily. Most eggs that are fresh can be good for 60 days, and do remember fertilized eggs can show signs, so look first. Do not wash eggs till use, the shell is permeable, and will absorb stuff. Where she works, they keep their cooler, which holds about 50,000 eggs in boxes of 360, 50 degrees or so. Fascinating! Thanks for sharing, Pat. I retired from the wood stove industry a few years ago. We often installed Vermont slate floor pads to increase the safety factor when burning wood. We used to coat the finished slate pads with sodium silicate, AKA water glass. Water glass is what the old Vermont farmers would dip eggs in to seal them. They would last for months without cold storage. 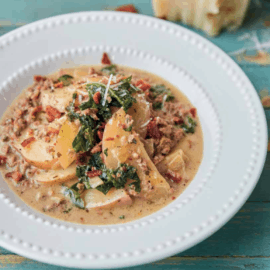 There was also the practice of the “egg bowl” when baking. Grandma would crack the eggs into a small bowl before adding them to a recipe. If there was a bad egg, and you could remain standing long enough, you could flip it out the back door onto the compost pile. Hi Jill! Question…I have been wanting to have my eggs out on the counter, yes, for pretty, but I have been unsure if it is ok in my situation. Yes, if they have been previously refrigerated, I would continue with that. Thank you for this post. We’ve had our hens for about a year now, and I have been keeping their eggs out on the counter. Should I wipe them off before cooking with them? That’s the only thing that concerns me is what could still be on the shell from the coop. Thanks! I have kept chickens off and on over 35 years, #1 reason is the fresh free ranged eggs. Ducks only the last 5 years, and oh my the baked goods are flat amazing! Store bought eggs are tasteless, and just do not compare. I like knowing what the chicken ate that laid the egg I am feeding my family with also. Years ago in Brazil I learned you can dip eggs in waterglass and then leave them on the counter for months with no problem. Guess it’s like reinforcing the cuticle. I refrigerate my unwashed eggs right away because we get too many eggs daily. I gave some to my sister and she said the yolks looked green. They were a month or two old by the time she used them. I haven’t noticed any green in the ones that I’ve eaten but some of them have really dark yolks. What do you think about that? Do you think they could have gone bad? Is there a way to test a egg to know it is still good? You can drop an egg in a glass of water, and how high the egg floats in the water indicates how dried the interior of the egg is. If most of the egg hangs down in the water, it’s very fresh, mid-way and those are the ones I boil, so they will peel easier, most of the egg is out of the water? I open to see if they are spoiled… if not, I scramble and give back to the girls, or scramble slightly and pour into my silicone trays to be frozen and popped into a freezer bag for egg-less winter days. I only wash when I get ready to use, unless badly soiled.If soiled, I use water that is cooler than the egg. The shell is porous, and using hot water will open the pores wider, so an ‘old lady’ told me, back before I was one, lol, and I wash with dish soap, rinse well, dry and put in a bowl in the fridge. Hope this helps. 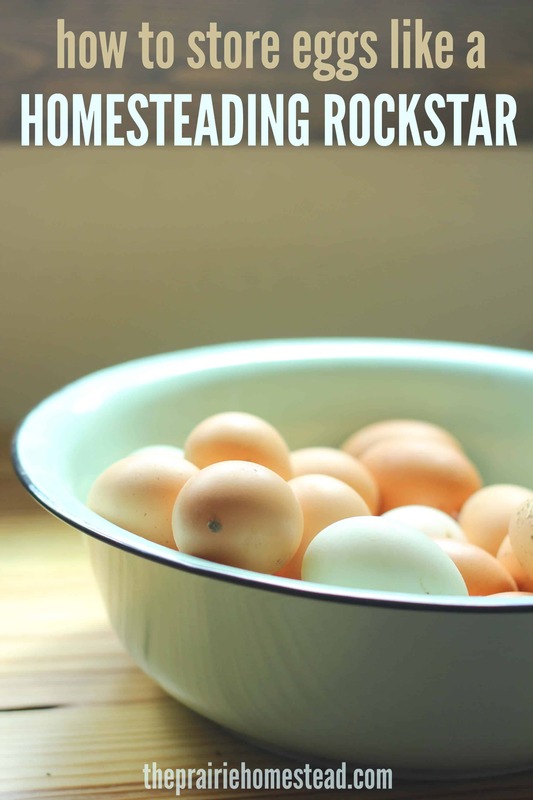 From experience, recently I left both boughten eggs and farm fresh eggs out for use. After 3 weeks, those that were left were like water when cracked open. At two weeks they were still fine; but after, they turned into liquid with no form whatsoever. Thank you for this information. I just bought two dozen eggs and my fridge went out. I guess I need to toss these,huh… since these are USA standardized eggs.